​Regardless of breed or size, every horse is built around the same basic skeletal structure, and, to a great extent, that structure determines the outward appearance of the horse. A general knowledge of where bones and muscles are in the body is invaluable to artists and riders alike. Once you have a working knowledge of anatomy, the important thing is that you begin to see posture when you look at a horse. Posture dictates comfort and function. The most comfortable and functionally efficient posture for a horse is one of relaxation with the neck lowered, back raised and hindquarters engaged. This is known as a functional weight-bearing posture. Any time a horse experiences chronic tension or discomfort, that horse will compensate by limiting his range of motion and/or using himself in an abnormal way. Countless situations from slippery footing to poorly fitting tack can cause tension or discomfort. Left unattended, this tension becomes chronic. Once chronic, muscles become too tight (hypertonic) compensatory patterns appear. ​This horse is relaxed and comfortable in his posture. He has a released poll, a telescoping neck, and a healthy back. Note the slight upward curve of the thoracic spine. This horse is relaxed and comfortable in his posture. A horse’s function is dictated by his posture. A braced posture produces movement that is forced and stiff, ugly to view and uncomfortable to ride. A horse that is released and balanced in his body is able to move with ease. (4) And lifting his withers and base. The structure of bones, their lengths, angles and they way they are put together dictates how a body will function in movement. That is why finding a horse with good conformation is so important. 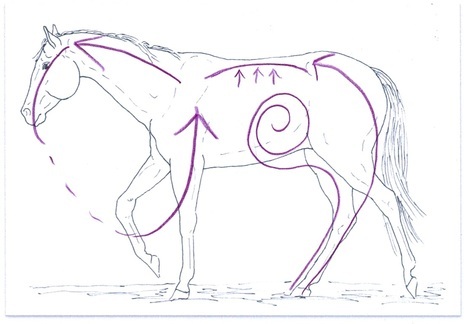 Even horses with good conformation will suffer from stresses placed on their structures if they are forced to move in bad posture. Self-carriage is the holy grail of advanced horsemanship, but it needs to become a concern of every rider, at every level of ability, no matter what discipline or activity they choose to follow. Horses must be in self-carriage in order to stay healthy and sound. Neutral posture allows freedom and ease of movement. Without it, movement becomes forced and tense. 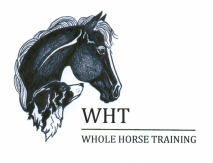 Probably the most important part of the training process for any riding horse is being taught to adjust his way of going and develop the strength needed to carry the weight of a rider. Unfortunately for most horse this step is rarely addressed.